John Taylor of Caroline (1753–1824) was one of the foremost philosophers of the States’ rights Jeffersonians of the early national period. 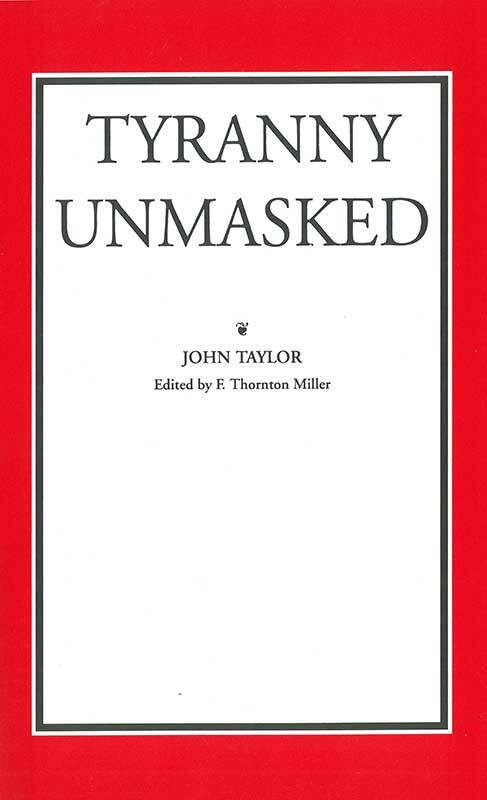 In keeping with his lifelong mission as a “minority man,” John Taylor wrote Tyranny Unmasked not only to assault the protective tariff and the mercantilist policies of the times but also “to examine general principles in relation to commerce, political economy, and a free government.” Originally published in 1822, it is the only major work of Taylor’s that has never before been reprinted. As an early discussion of the principles of governmental power and their relationship to political economy and liberty, Tyranny Unmasked is an important primary source in the study of American history and political thought. F. Thornton Miller is Assistant Professor of History at Southwest Missouri State University. Foreword, selected bibliography, preface to the first edition, index.